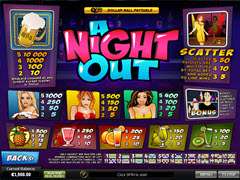 A Night Out Slot is a video pokie that has been released through the Playtech software. This 20 payline pokie offers you a night out on the town in style with wilds, scatters, free spins, a bonus round and the ability to participate in the Dollar ball progressive jackpot game. The game offers a maximum win of $250,000 during regular play. A Night Out offers bets from a penny per line up to fifty cents a line and if you are feeling lucky you can wager as much as ten coins on each of the 20 paylines. This is no small wager and amounts to $1000 for each spin if playing the max coins and coin size however it can also return some huge wins and that is how you will win the top prize of $250,000. That is high stake partying like never before that could see it become a night to never forget. The theme of this pokie is a bunch of girls out on the town having a good time dancing and then some. The images that are found within the pokie shows a night club vibe with people having fun and dancing along with those awful colors often found in the clubs that somehow seem great at the time. There are some wild girls dressed in assortment of colored dresses and they are joined by different types of drinks and a number of other symbols like a bartender and glass of ale, all of which will be the bonus icons in this game. There is a wild symbol in this slot and that is the mug of beer. It does exactly what a wild symbol should do and matches most other symbols but not the bonus ones. It will also award you with coins, up to 10,000 of them if you get 5 on a payline that is active. The best thing is will not only award those coins but also increase the number of paylines you win on. That scatter symbol is a value commodity as it will multiply wins by the amount that you bet. This starts with three scatters and a win of five times you bet and then progress to ten times for four and fifty times should you get all five of the available scatters across the reels of the slot. When that bartender comes calling he will trigger a bonus game that is a pick feature that will award a multiplier for free spins and also free spins. These can be a great one to catch as free spins often add some good credits to your balance. If you opt to place a side bet on the Dollar ball progressive jackpot you will have five numbers chosen and depending on the results of the draw for each spin you could find a jackpot on the horizon. There are also other wins for matching some but not all of the balls that are drawn. A night Out is a fun featured game that the ladies will love to play as they get ready for a night on the town and remember the days when a carefree lifestyle was what life was about.